Here’s one final fact concerning the odd Earth shapes I’ve been hinting about: there are more than 500,000 of them. They are not man-made. How did they come to exist, why, and when? 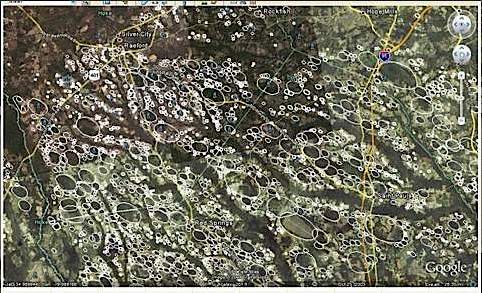 In this small image from Google Earth, you can see hundreds of them outlined within a two-county area in the U.S. Thursday, the rest of the story. I’ve seen something similar in western Kansas. The circles are made by gigantic watering systems that prowl in a circle across fields. I’m not sure yours are the same thing. I am fascinated! Can’t wait to find out more. You said “2 county area in the U.S. – where are these? Thanks for the link as well.